Stories To Tell: Island Cemetery: What spirits walk Galveston Island? 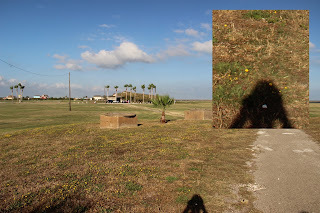 Island Cemetery: What spirits walk Galveston Island? Warning: Please read no further unless you wish to know the truth. Traditionally, spirits tend to walk outside of cemeteries. Though the dead bodies are buried there, their life-force left long before they were laid down to their final resting place. But Galveston is different. In the great storm of 1900, thousands of lives died. Some washed out to sea. Others sank in the sand. Still, some were buried in debris. Children were paid to haul bodies in wagons. So many dead were found that the adults in charge decided to dump the deceased, weighted down, into the waters away from the island. Unfortunately, they washed back up bloated, rotten, and eaten. This resulted in two huge bonfires to burn the putrid corspes. It lasted for weeks. The stench was terrible. The land was corrupted. Clean up began. Note: For the longest time, no one would eat seafood for fear they would be devouring their own loved ones. Men were forced at gunpoint to help in the collection of the dead. Only one was shot for refusing to work. The others then fell in line. Of all the places known to modern civilization, can it be any wonder that residual energy would still exist there today? Wars were fought on the island. The cries of native women and children rose as they were slaughtered. For untold years after the 1900 event, death haunted the city. And yet, they rebuilt. On the graves of those buried, burned, or without remembrance, entire blocks of buildings have been placed. A seawall was added to help against nature’s attacks. The city prospered again. For us, this particular adventure started on October 30th, 2016. It was one of several. For three days we hunted Galveston for the paranormal. Our guide showed us around the Strand, an area of downtown Galveston. We learned fascinating history and ghostly stories but the end of the tour became even more enthralling. It is a three-story home, was built before the Civil War, and was used as a hospital for Confederate soldiers. It is constructed of brick and cast iron. Interestingly, the house is not only surrounded by an iron fence but has iron rails and supports around its front interior. Because of the investigation, we were given relatively free access to the house. What we found was intriguing. On the stairwell from the third to the second floor, sharp spikes would abruptly appear on our EMF detector and then vanish. The stairway, we were told, was the one Tilly Brown would use. A bedroom was on the third floor. The third floor was said to have most of the paranormal activity. Both Claudette Peercy and Jackie Smith https://jackiesmith114.wordpress.com/2016/11/04/ghosts-of-galveston/ ) received readings at separate times: sharp spikes and then nothing. The energy appeared to move up and down the stairs. Down below, in the golden room, Jackie noticed high EMF spikes in the corner of all Miss Bettie Brown’s paintings. It was always by the signature on the painting. We found no electrical lines around these areas. Was this Bettie’s way of saying she appreciated us enjoying her artwork? In the great banquet hall, just as one enters from the main house, we found massive, constant, and repeatable EMF readings emanating from the floor. When we asked our host what was down below, they said, ‘Nothing.’ Upon further investigation, we discovered a basement had been below the house at one time. However, after the storm of 1900, they had filled it in. It makes you wonder, had this basement been used as a makeshift tomb? We snapped pictures, ran thermal scans, and recorded EMF readings. Around 2 am in the morning, exhaustion started to set in. Still filled with excitement but unable to continue without rest, we headed off to our hotel. We took many pictures, ran a few EMF scans, but seemed to come up with nothing too unusual, until this one photo. It wasn’t until later that it caught my attention. It is the shadow of a person following us who was not part of our group. I say ‘shadow’ because we saw no one else at the time. By the evening, we were back at Ashton Villa. This time, it was the official tour, not the investigation. Our access was severely limited. We were not allowed on the third story so we could not verify the EMF readings we had recorded the night before. We were guided room by room with some great stories by those who helped take care of the mansion and the odd things they had encountered. A partial confirmation was attained. The signal strength on the floor of the banquet room was just as strong as ever. However, before the stroke of twelve, we were hurried out the door. It felt like they were afraid of being in Ashton Villa after midnight, especially on Halloween night. With some of the stories that our guide told, perhaps there was a concern. 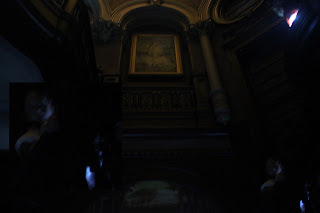 I did notice that every time I raised the camera to take a photo, the tour guide watched me with darting eyes as if expecting I had caught something. She warned us to be watchful for Confederate ghost soldiers as we left the manor out the backdoor. Still taking pictures, I stopped by the gazebo and found this. Once more, I thought nothing as I snapped it, not even realizing there was a shadow. No people were in view. It wasn’t until later when I was evaluating what we had captured that I realized the two images, one at Fort Travis and this one, were similar. 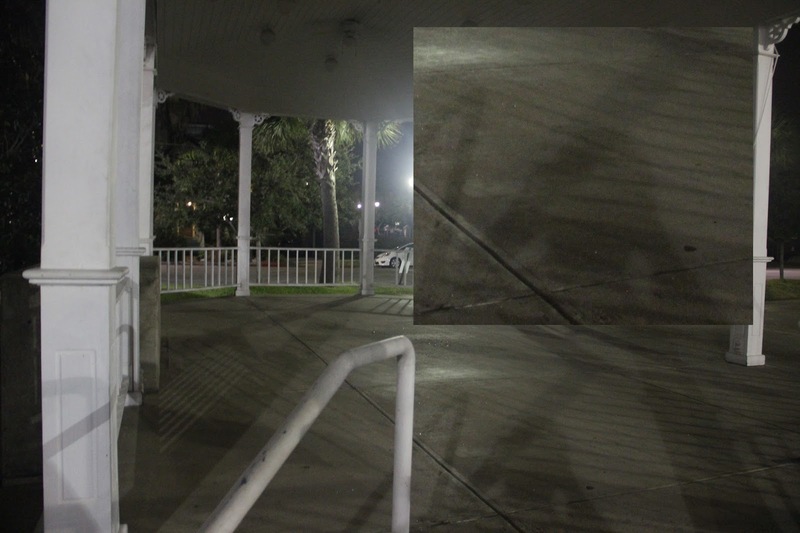 Had the ghost of Miss Bettie Brown followed us to Fort Travis? Had she followed me at Ashton Villa? Perhaps we’ll never know. However, if I get another shadow in a picture, it will definitely make me look twice! The three of us, Jackie Smith, Claudette Peercy, and I head to a place called Bishop’s Palace. We get there early. We snap great pictures of the outside and explore the basement. The basement has been converted into a souvenir shop. It’s cool but much too commercialized. On top of that, the EMF detector shoots to the top and holds all around the checkout counter. Right off the bat, we know there is way too much electrical in that area to even try and detect a spirit signature. To the store clerk’s surprise, we use the EMF device to identify the wifi router behind the counter. Bishop’s Palace is one of the only four homes that remained after the flood in the storm of 1900. At the time, it was built seven feet above sea level. When the storm came in, they helped to fish out as many people as they could to save them. The architecture is absolutely wonderful. The rounded towers, statues, and ornate artwork make a unique and beautiful setting. When the host comes out and invites us in, he is dressed in ghoulish white makeup and a suit. In the spirit of Halloween, they have provided other actors to appear as the tour progresses. With EMF out, we probe as we walk. The dumb waiter in the building no longer works. They use it to run networking and electrical lines from the bottom basement to the top floor. Once more, though we can detect the location of the lines, it makes the device useless for finding energetic spirit manifestations. Our group is fairly large. There are enough people that the thermal scanner is not practical. As we get to the second story, a sensitive claims she detects a little boy playing on this floor. There are no children in our group. I can hear her talking outside the room I am in, but we get no spikes. Nothing seems unusual until we get to the second floor chapel. Strangely, on a hunch, we check each of the prayer benches. 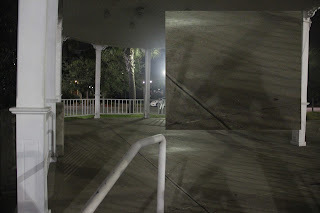 The EMF detector shoots up to the top two or three times on three of the four benches and then drops to normal. It does not repeat no matter how many times we check it again. If we didn’t know better, it was like a child had played in the room bouncing from one cushion to another. Our guide moves on, but if it was the child causing the spiking, he appears to have slipped away too. We listen to the history. The tour guide finishes. We start the journey down the stairs. Once we hit the bottom floor, everyone starts out through the front doors. I turn back one last time to take a picture of the curving ornate staircase and the picture in the center. One of the tour guides is holding a red lantern at the half circle landing in the upper right corner. There is no one else on the stairs. I snap the picture and turn to go. Talking with some of those who helped with the tour, the lights come on. We say our goodbyes. It wasn’t until that night that I realize something unusual was caught. Remember what I said? No one else was on the stairs except someone on the landing. Oddly, in the picture I took, there are now two people. Not only is there a second person, but he is shorter than everyone else in the group we were just with and barely tall enough to have his shoulder over the banister. Who or what he is, I cannot say, but the photograph caught him when my eye did not. It was quite an experience. So glad we got to make the trip together!